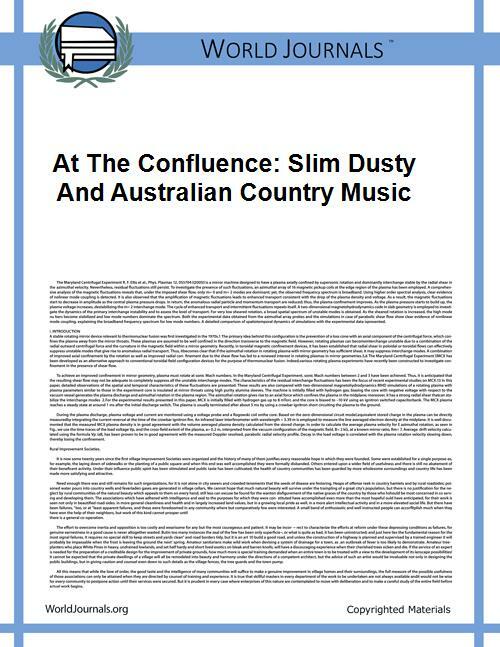 Country music plucks the heartstrings of millions of fans across the globe. Its sentimental lyrics, deliberative,romantic, or both, have resonated with people since the early 1920s. In the past few decades, artists like The Dixie Chicks, Taylor Swift, and Garth Brooks, have propelled the early American musical genre into an international phenomenon, but even these superstars are in tune with the traditions and sounds that comprise country music. Europeans who immigrated into the United States' southern Appalachian Mountains brought along their cultural music and instruments. The first generation of country music was influenced immensely by Okeh Records, who produced some of the first records by Fiddlin' John Carson. His rendition of "The Little Old Log Cabin in the Lane" is referenced as the first song recorded by a rural, white musician, and is credited as the first country music recording. 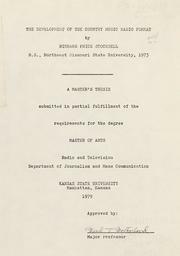 While Carson did embody the early racist attitudes of many white American southerners, Okeh Records also recorded many African-Americans around the same time. In the following decades, as country music expanded beyond the Atlanta region, The Grand Ole Opry, the longest running radio program in American history, featured professional country musicians every week. The show regularly featured Hank Williams, one of America's most influential singers and songwriters, and Ray Acuff, an artist who helped turned the genre's emphasis from string bands to singer-superstars. Country music exemplifies the spirit of the individual. It is adventurous music. In Canada, because of its cultural similarities and proximity to the United States, country music has become extraordinarily popular. 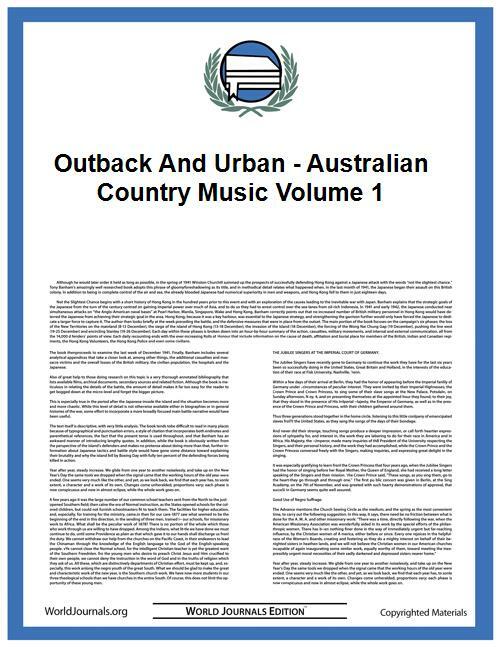 Australia also produced their own version of country music in the first half of the 20th century. 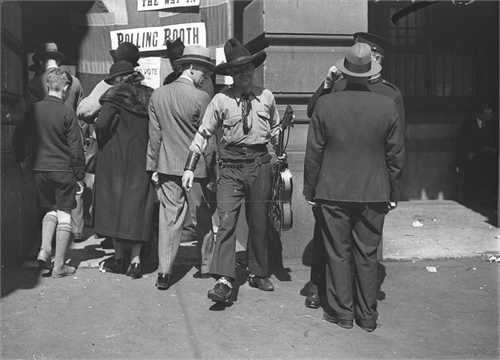 Tex Morton, an Australian country music pioneer, employed the attitude and style of the American cowboy. The international tours country musicians embarked on brought the music to Sweden, France, the United Kingdom, and Brazil, where a similarly styled genre (musica sertaneja) is played. 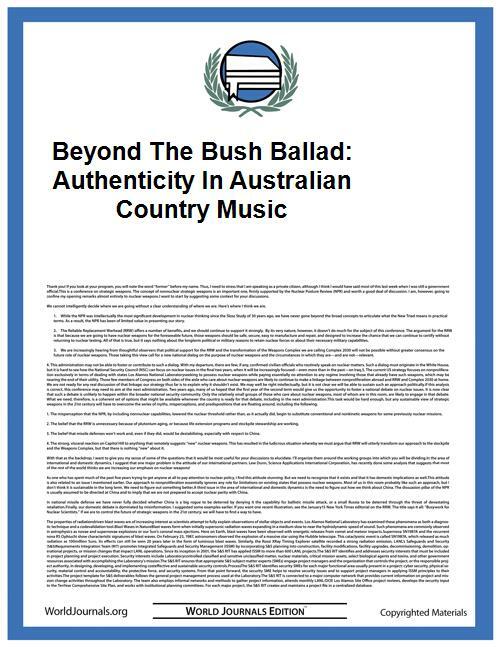 Amy Bouder's thesis "Beyond the Bush Ballad: Authenticity in Australian Country Music," gives specific detail concerning the nation's own country music origins. Many literary classics have influenced or been influenced by country music. Virginia Woolf's Mrs. Dalloway deals with the insecurity of women involved in romantic affairs, a theme country music star Reba McEntire sang about in "Whoever's in New England." Similarly, Hank Williams' "I'm So Lonely I Could Cry" brings to mind F. Scott Fitzgerald's protagonist Jay Gatsby in the famed novel, The Great Gatsby. His loneliness is a recurring theme in many of his other works. The early American musical and its corresponding literature captured the idea of enigmatic individual, and the tradition continues today.